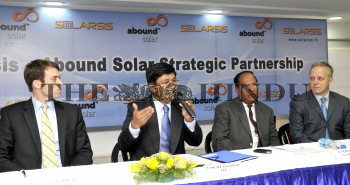 Caption : HYDERABAD (AP/ BL/ REPORT: VRK) -23-03-2011- (from left) Mr. Erik Mikyasa , Director , Abound Solar , Mr Venkat Rajaraman, CEO of Solarsis , Mr .G. G. Choudhury , president of Solarsis and Mr Julian Hawkins , Senior Vice -President ( Sales and Marketing ) of Abound Solar exchanging documents to partner the high growth Indian Photovoltaic market ; in Hyderabad on Wednesday. PHOTO: P_V_SIVAKUMAR .